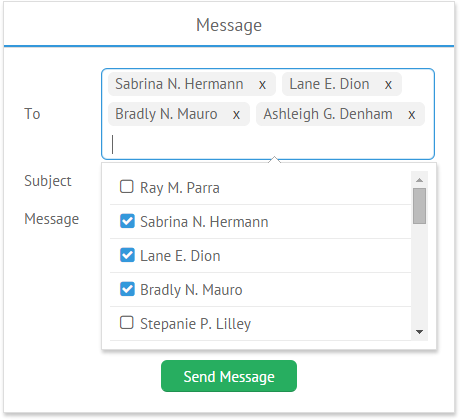 Multicombo is an editable control that allows for choosing several options at a time from a dedicated popup list, Checksuggest. To remove an option from selection, click either the "cross" sign or use the "backspace" key in the input field or uncheck the option in the list. suggest: names // or e.g. suggest: "data/names.js"
keepText (boolean) - defines whether the entered text should be kept in the input after an option is selected. You can read about advanced configuration options for popup selectors in the corresponding documentation article. 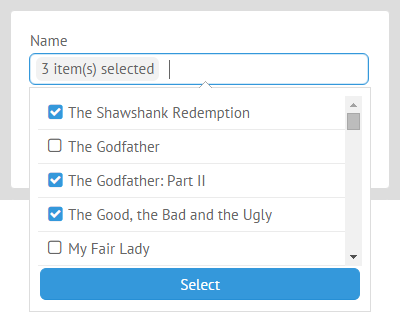 In some cases, multicombo can not be shown as a multi-line input and information about selected items should be displayed only as a number of these items. There is a possibility to select/unselect all options of the Multicombo control.